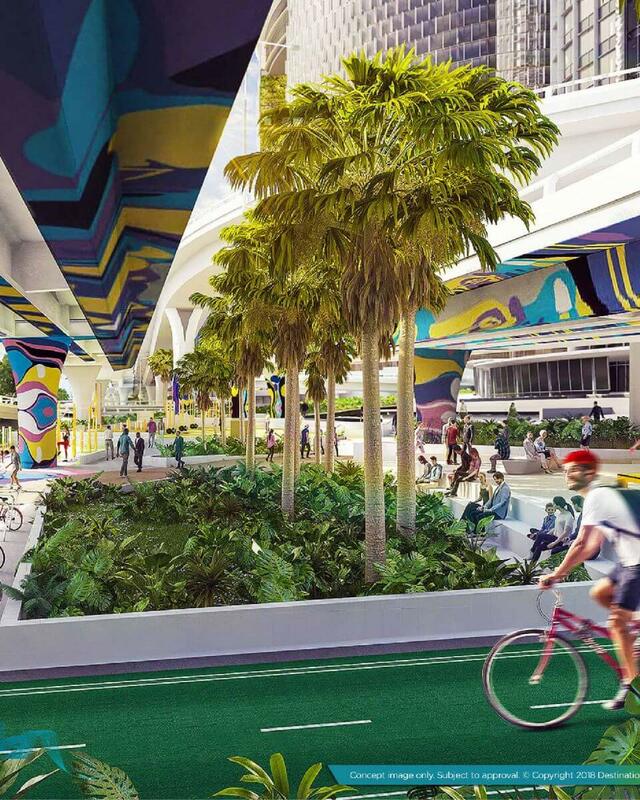 A maze of outlines, colour and shapes have appeared on the underside of Brisbane’s Riverside Expressway, ahead of a makeover that is set to transform the tired and disused waterfront area. The stunning mural that has been applied to the underside of the Riverside Expressway in the new Waterline Park uses the subtropical colours of Queensland, and forms part of the overall design of the new vibrant public recreation space that forms part of the Queen’s Wharf Brisbane development. The artwork is the creation of Australian artist Alice Lang and represents the tidal movements of the Brisbane River which she observed while living in the River City. It is the first artwork selected by an independent Art Panel, established by the Destination Brisbane Consortium, to guide decisions on the consortium’s purchase of art that will feature in public spaces throughout the precinct. UAP Principal and Senior Curator Natasha Smith. Destination Brisbane Consortium Project Director Simon Crooks said the consortium recognised the importance of appointing an independent art panel to identify art opportunities that would strengthen the visitor experience for the Queen’s Wharf Precinct. “Queen’s Wharf Brisbane will be a destination that inspires, surprises and entertains residents and the expected 1.39 million additional visitors each year. “A key requirement will be creating experiences for people in our precinct and the art installations throughout the precinct will play a significant role. “The Brisbane River is a key feature of our development, so it is appropriate and fitting to have a substantial piece of art that pays tribute to it and its influence over our city. “This beautifully colourful discovery piece by Australian artist Alice Lang respectfully pays tribute to the river and will bring new life to what has, until now, been a concrete parking area. Art Panel member and Director of the Queensland Art Gallery | Gallery of Modern Art (QAGOMA) Chris Saines says Queen’s Wharf Brisbane’s renewal of public space was a welcome opportunity to make art a centrepiece of Brisbane’s newest waterfront space. “Alice Lang’s work is a vibrant first step toward activating this part of Brisbane’s riverfront,” Mr Saines said. “Our job as members of the art panel was to draw on our experience and specialist knowledge to find the most suitable works to complement the Queen’s Wharf development while drawing in visitors. “The panel felt that Alice Lang’s work channelled the spirit of the area through the influence of the river and aimed to provide a sense of optimism for an area long in need of renewal. Completion of the new Waterline Park is expected in the second half of 2019. When complete it will be a place of respite for workers during the week and a place of recreation for families on weekends. It will contain table tennis tables, exercise equipment, shaded seating areas and subtropical landscaping across its 4,000m2.